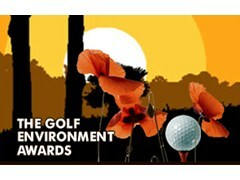 The 2011 Golf Environment Awards have been launched, seeking to recognise the great environmental and ecological practices of golf clubs throughout the UK, and helping to promote the exceptional work that is going into making golf greener. The Awards, now in their 14th year, have identified some great projects and focus from clubs and individuals all over the country and have shown firsthand what a difference they have made from an environmental perspective. Greenkeepers have the chance to win some incredible prizes for themselves and their Clubs. STRI Environment Consultant, Richard Stuttard, reported: "The Golf Environment Awards were developed to reward clubs and individuals that are demonstrating outstanding and innovative practice. They also highlight and promote the importance of these projects across the golfing industry. "Golf sometimes gets a bad name with regard to the environment, and this is a perception we would like to see changed over the next few years, as we can shout, more and more, about the great things golf clubs are doing to enhance the environment and local regions all over the UK," he added. Mr Stuttard highlighted that Justin Rose is also continuing his role as the official Ambassador of the Awards, giving the project support from a player's perspective and showing that the importance of environmental issues is recognised at the very top of the game. The two overall winners from last year, James Hutchinson of Fairhaven Golf Club and Colin Webber of Portmore Golf Park, received a prize trip to Florida, where they experienced a tour of some of the world's most prestigious and environmentally focused golf courses. The work both have put into the environmental management of their courses is outstanding and they were definitely worthy winners of the 2010 prize and the accolade they received at the Prize Winners Dinner during BTME Week in January. Read more about Colin Webber and the 2010 Golf Environment Award winners here. Over recent years hundreds of golf clubs have focussed on developing their environmental management practices; the Awards are designed to promote the good work these clubs are doing. "We would encourage any golf club that focuses on environmental issues to enter - the winners are chosen for their dedication and enthusiasm to succeed, and not on the scale of project or size of golf club," said Mr Stuttard. Syngenta Turf & Landscape Portfolio Manager, Rod Burke, added: "As one of the Golf Environment Award sponsors we are very proud to continue our support. We are looking forward to seeing what new and exciting environmental innovations and projects are submitted to the awards in 2011." Full details of the Award winners and the practical ideas they have developed will be published in the dedicated Environment pages of the GreenCast website. Entry to the 2011 awards is now open. Entry is free and details can be found on the website http://www.golfenvironmentawards.com/All clubs should have received a postal application form too. Five regional awards and one overall winner award recognising golf courses that have implemented a successful environmental management strategy, with clear objectives and targets on how this strategy will directly contribute to a better environment. To recognise an outstanding individual contribution to the success of environmental and ecological management.